Snow + Yoga= Snowga Join us 9 - 9:45am Saturday mornings! Join us for one of winter’s hottest new activities, snowga, led by Yoga High. Snow + Yoga = Snowga. A fun way to combine being outside while practicing yoga. 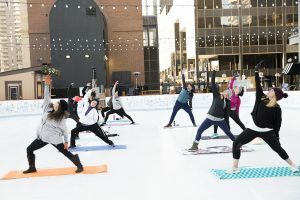 Focusing on breath control, meditation and asanas / postures, and made for all levels – come breathe in that crisp Denver air, soak up some Vitamin D and stretch out those muscles on the ice at the Downtown Denver Rink at Skyline Park. Is This Different From Indoor Yoga? For our outdoor yoga sessions you’ll want to dress warm. Think: jacket, hat, gloves and warm footwear (which you’ll keep on throughout the session) and because it’s Denver…probably sunglasses. But other than that, bring your Yoga mat, towel (to prevent slippage) water, footwear (which will remain on during the class), gloves and outerwear to stay warm and Yoga High will lead you through a 45-minute flow yoga session – perfect for all levels. The class is donation based with all proceeds benefiting the nonprofit Set Them Free, which helps fight human trafficking. Cancellation Policy: if the temperature fails to reach 32 degrees by 8 am snowga will be cancelled. We will do our best to use all available media outlets to inform participants by 8 am if class will not be held. We will have waivers available on-site, but if you prefer to print and bring it with you the waiver is accessible here. Head to our Facebook Page for more Downtown Denver Rink events! Would you like to recieve news from the Downtown Denver Partnership? I agree to receive emails from the Downtown Denver Partnership. Join our growing group of more than 700 Member businesses today! © 2019 Downtown Denver Partnership All Right Reserved.